Meet at the gazebo near the equivalent of 12th Avenue and Gilpin Street. The cost is $10. A copy of this schedule and information about Goodstein’s books is at LeonardLeonard.com/neighborhoods/walkingtours. This is a free lecture at RedLine, the south corner of 24th and Arapahoe streets, to mark Phil Goodstein’s new book, Curtis Park, Five Points, and Beyond: The Heart of Historic East Denver. As part of a tour of houses and restaurants on North Capitol Hill, Phil Goodstein will be talking about his books and selling copies of them, including The Ghosts of Capitol Hill, at the Castle Marne, 1572 Race Street. This is a free lecture at the Gardens at St. Elizabeth’s, at the northeast corner of West 32nd Avenue and Eliot Street. (Eliot is one block east of Federal Boulevard. St. Elizabeth’s is the highrise.) East Denver was once the land that is modern downtown. Within a few years, it referred to the sterling Victorian area around the city’s first park, Curtis Park. How the area evolved is the subject of Curtis Park, Five Points, and Beyond. 440 pages. $24.95. Meet at the statute of the Indian on the east lawn of the Capitol along Grant Street between Colfax and 14th avenues. The cost is $20.00. Meet by the fence across the road from the Madonna Mausoleum. The main entrance to Mount Olivet is west of Youngfield Street on West 44th Avenue. Go up the hill past the administration building to near where there is a big crucifix. On your left is the Madonna Mausoleum. (Coming from the east take exit 266 on Ward Road from I-70 and go west about a half mile to the cemetery. Coming from the west take exit 265 at Youngfield and go north about a mile to West 44th Avenue and turn left. The cemetery is the first exit on the right.) The cost is $10. Phil Goodstein will be hustling his books, especially Park Hill Promise, at the Park Hill Street Fair. This is a free event. The booth should be near 19th Avenue and Forest Street. Gather at the parking lot along the main road of the graveyard, just west of the administration building along West 29th Avenue about two blocks west of Wadsworth Boulevard. The cost is $10.00. This is a free lecture about the spooks and spirits of South Denver at the Decker Library, South Logan Street and Florida Avenue. (Logan Street is four blocks east of Broadway. Florida Avenue is four blocks south of Mississippi Avenue.) It features Phil Goodstein’s book, The Ghosts of University Park, Platt Park, and Beyond. Meet at the gazebo near the equivalent of 12th Avenue and Gilpin Street. The cost is $10.00. This is a free talk featuring the city’s ghost lore. It is at the Cherry Creek Library, northwest corner of Third Avenue and Milwaukee Street. (Milwaukee is six blocks east of University Boulevard.) 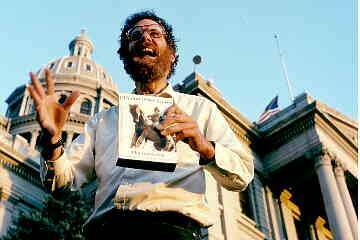 It draws on Phil Goodstein’s volume, The Ghosts of Denver: Capitol Hill. Meet at the statute of the Indian on the east lawn of the Capitol along Grant Street between Colfax and 14th avenues. The cost is $20.00. It will be repeated on October 24, October 25 and October 31. This is a free lecture about the history of Park Hill featuring the usual and bizarre happenings in the neighborhood. It gathers at the Park Hill Library at the northeast corner of Montview Boulevard and Dexter Street. The Colfax Tattered Cover, Colfax and Elizabeth Street (across from East High School, two blocks east of York Street), will host a talk and signing of Curtis Park, Five Points, and Beyond. Find out more about Phil Goodstein’s books and Curtis Park in another free lecture. It is at the Book Bar, a combination wine bar/bookstore, at West 43rd Avenue and Tennyson Street.